Noctua’s DX line CPU coolers have become a default choice in premium grade quiet cooling solutions for Intel Xeon processors. The NH-U14S DX-3647 features a larger, custom-designed contact surface and supports both square and narrow type LGA3647 platforms. Based on the proven, 140mm size NH-U14S heatsink and equipped with Noctua’s award-winning, PWM controlled NF-A15 140mm fan, it combines maximum performance and superb acoustics. Topped off with the professional SecuFirm2™ mounting system and pre-applied NT-H1 thermal compound, the NH-U14S DX-3647 forms a complete premium quality package for quietly cooling LGA3647 based Xeon workstations and servers. Please note that the NH-U14S DX-3647 is a dedicated version for the Intel LGA3647 socket. Due to its customised larger base, it cannot be used on any other sockets and is incompatible with Noctua’s standard mounting kits. First introduced in 2008, Noctua’s DX line CPU coolers have become a standard choice when it comes to quiet, premium grade air cooling solutions for Intel Xeon processors. Thanks to their superior acoustic efficiency, they are ideal for workstations and servers that run in noise sensitive environments (e.g. audio/video production, content creation, engineering, etc.). The new DX-3647 line coolers are dedicated, customised solutions for Intel’s professional LGA3647 platform, which makes them an ideal fit for both Skylake-SP based Xeon Scalable CPUs (Platinum, Gold, Silver or Bronze, Purley series) and Xeon-Phi processors (code names Knight’s Landing or Knight’s Mill). At 70x56mm, the heatsink’s copper contact surface is more than double the size of the standard model. Tailored to fit the enormous integrated heat-spreaders (IHS) of Intel’s LGA3647-based processors, this customised design allows for an optimal heat flow from the CPU over the base to the heatpipes and on to the cooling fins. The heatsink’s SecuFirm2™ mounting system includes two sets of brackets in order to support both square and narrow type LGA3647 sockets. Thanks to pre-installed mounting screws and the included processor clips (square type and narrow type without Omni-Path fabric connector, with fabric connector on request), the installation procedure is easy, quick and secure. With six heatpipes, a fin surface area of more than 6000cm² and the large, highly optimised NF-A15 140mm fan, the NH-U14S DX-3647 provides a superior level of quiet cooling efficiency. This makes it ideal for building cutting-edge, ultra high-performance Xeon-based workstations that run almost silent. Complying with Noctua’s AAO standard and featuring sophisticated aerodynamic design measures such as Flow Acceleration Channels, the NF-A15 has quickly built up a reputation as one of the best 140mm heatsink fans on the market. The renowned NF-A15 140mm premium fan supplied with the NH-U14S DX-3647 supports PWM for convenient automatic speed control through the motherboard, which allows it to run near silent at lighter loads and speed up only when necessary. Noctua’s much-acclaimed NT-H1 is a pro-grade TIM solution that provides minimum thermal resistance and outstanding long-term stability. Having the paste pre-applied to the heatsink base ensures optimal bond-line thickness and saves precious time in installation. Ideal for system integrators! Noctua products are renowned for their impeccable quality and outstanding longevity. True to this legacy, the NH-U14S DX-3647 heatsink is built to last, and like all Noctua fans, the supplied NF-A15 unit features an MTTF rating of more than 150,000 hours. The entire package comes with a full 6-year manufacturer’s warranty. Noctua NH-U14S DX-3647 является самым тихим кулером из тройки доступных вариантов. Конечно, он самый массивный, но именно благодаря этому мы можем использовать один тихий вентилятор, добившись минимального уровня шума – при максимальной скорости работы его не слышно, а при автоматическом управлении (800-900 об/мин) его не услышать даже наклонившись к системе в упор. Что касается эффективности, то она примерно равна NH-U12S DX-3647. Отличия заключаются в габаритах и в количестве вентиляторов, что и позволяет добиться равной эффективности. Если не брать во внимание габариты, то NH-U14S DX-3647 тише, даже если сравнивать максимальные обороты флагмана и автоматическое управление вентиляторами NH-U12S DX-3647. Noctua broke the mold with their new NH-U14S DX-3647 cooler. It can handle both narrow and square sockets with Noctua’s SecuFirm2 mounting system, and the oversized NF-A15 PWM fan excels at keeping the heatsink cool and makes little noise. If you are building a high-end Intel Xeon Scalable workstation for yourself or for your clients, you should look at these coolers. Undoubtedly the Noctua NH-U14S DX-3647 heatsink is massive compared to most LGA3647 heatsinks. As a result, it will not fit most standard 4U workstation cases. We could not install the DX-3647 in our testing workstation based on a Supermicro SC747. This is a 4U workstation case as the NH-U14S is too tall. Our main workstation based on a Thermaltake Core X9 which is oversized for most users, it does handle the DX-3647 and has plenty of space left over. The SNK-P0068APS4 led to an average temperature of 31C at its full fan-speed while the Noctua NH-D9 DX-3647 4U had an average temperature of 23.5C with its fans at their full speed or 38.8C when using the automatic fan control enabled via the BIOS. The minimum and maximum core temperatures were also aligned with expectations. The Noctua heatsink did a nice job of allowing this Intel Xeon Silver CPU to run extremely cool inside this 4U chassis even at full load. Does the NF-A15 PWM that comes with Noctua coolers run at a different speed (1500rpm) than the retail model (1200rpm)? How can I determine if the motherboard’s UEFI BIOS is overclocking my processor by default and deactivate this automatic overclocking? Which Noctua fan or CPU cooler should I buy? How to choose the right model? I have difficulties installing the cooler, can you help? My case supports CPU coolers of up to XXXmm height, which model should I choose? I'm experiencing fan speed issues with my motherboard from Supermicro, what can I do? Can I install a Noctua cooler in my system from Acer, Dell, HP or Lenovo? What Thermal Design Power (TDP) is this cooler recommended for and how much Watt (W) of heat can it dissipate? How should I clean my Noctua cooler? My Noctua PWM fan runs at a much higher minimum speed than advertised, what is wrong? My Noctua PWM fan starts to spin when the PC boots but then stops, what is wrong? I get a CPU fan error using my Noctua PWM fan, is it faulty? I get a CPU fan error despite the fan is running! Is it possible to use the cooler with vertical graphic cards? Yes, the NF-A15 PWM bundled with our heatsinks is specified to run at 1500rpm (see cooler specifications for details) and the retail model is specified to run at 1200rpm (see fan specifications for details). The 1200rpm retail model is ideal for setting up push/pull configurations in combination with the coolers’ 1500rpm stock fan because the combination of the 1500 and 1200rpm models provides a better balance of performance and noise than the combination of two 1500rpm versions. On dual-tower coolers such as the NH-D15S, we recommend to run the 1500rpm version in the center and the 1200rpm version on the front. On single-tower coolers such as the NH-U14S, we recommend to run the 1500rpm version on the front and the 1200rpm version on the back of the cooler. The NA-YC1 y-cable supplied with the retail fan can be used in order to control both fans via one PWM fan header. In this case, both fans will scale individually according to the PWM duty cycle supplied by the motherboard, e.g. they will run at ~1500/1200 respectively at 100% duty cycle, ~750/600rpm at 50% duty cycle, etc. Both at 100% and lower speeds, the speed difference between the fans reduces resonance phenomena and thus helps to achieve the best balance of performance and noise. Most motherboard vendors allow their overclocking-enabled products (e.g. those with Intels X- or Z-series chipsets) to run the processor at increased clock speeds by default, without requiring any user action at all. Since TDP (Thermal Design Power) limits are usually also disabled by default, this leads to the CPU exceeding the rated TDP to a varying degree, depending on the used applications and their workloads. Due to the increased heat output of the CPU, you may see higher CPU temperatures than expected. In order to find out if your motherboard is overclocking your processor by default, please enter the UEFI BIOS and select the “advanced” or “overclocking” menu. There you should be able to find options such as “MultiCore Enhancement” (options: enabled/disabled), “CPU Ratio Apply Mode” (options: all/per core) or similar. To disable the automatic overclocking, adjust the settings either to “disabled” or “per core” and make sure that the individual multipliers match the original specifications. In doubt, please contact your motherboard vendor for detailed instructions on how to disable this feature. Not sure which Noctua product to buy? Our detailed buying guides for fans and CPU coolers help you to choose the model that works best for you. Please refer to the installation manual and our video installation guides for detailed instructions on how to install the cooler. Please refer to our TDP guide in order to select the cooler that offers the best cooling performance at a given height. The BIOS of many motherboard models from Supermicro expects a certain minimum fan speed (usually 600 or 700rpm), which is higher than the minimum fan speed that can be achieved with Noctua's PWM fan models. The BIOS may interpret the low minimum RPM of Noctua fans as a fan error and thus try to run the fan at 100% for a short period before going back to automatic control. This can result in oscillating fan speeds and fan speed warnings in the BIOS or the fan management console. Unfortunately there is usually no option to set a lower minimum value in the BIOS that would suit the low minimum speed of Noctua PWM fans. The issue can thus only be resolved by either disabling automatic fan speed control in BIOS, which will cause the fans to run at a constant speed, by using 3rd party tools like IPMItool or IPMIutil, or by requesting a modified BIOS file from Supermicro, which takes the minimum fan speed of Noctua fans into account (charges might apply). Please note that any modifications performed with 3rd party tools are done at your own risk and that Noctua can not be held responsible for any possible issues. Systems from Acer, Apple, Dell, HP, Lenovo or other major brands often use motherboards which differ slightly from the specifications issued by Intel and AMD. While those changes are usually subtle, they can lead to compatibility issues with coolers that were built to comply with these specifications. Even in case the cooler is mechanically compatible and can be installed, other issues can occur, e.g. proprietary fan connectors, BIOS errors due to a low fan speed, shutdowns, etc. Some of these problems can be avoided with some technical knowledge, but especially BIOS related issues can often not be resolved. Due to the large number of possible issues that cannot be resolved with different mounting parts alone, Noctua does not officially support systems from Acer, Apple, Dell, HP, Lenovo or other major brands. Please refer to our CPU compatibility list for information on maximum recommended TDP and heat dissipation. Dust: Fans and heatsinks inside computer cases tend to accumulate dust over longer periods of usage. In order to maintain maximum performance, please clean your fan and heatsink regularly. For cleaning, please first remove the fan from the heatsink and clean it using a duster, slightly moist tissue or canned air. Please be careful not to use too much force in order to prevent any damage to the fan. Please do not use a vacuum cleaner as this may apply excessive force to the fan and do not put the fan under running water as water residues inside the motor may lead to short circuits. Please also note that the fan is not designed to be taken apart by the user. Removing the impeller from the frame will break the sealing of the bearing and results in a loss of warranty. Before reinstalling the fan, clean the heatsink itself with a duster or vacuum cleaner. Do not use water to clean the cooler. Finally put the fan back on and connect it to your motherboard fan header or fan controller. Thermal paste residues: Whenever you take off the heatsink from the CPU, we recommend to clean the CPU as well as the base of the cooler before re-applying thermal paste and re-installing the cooler. You can either just wipe the base and the CPU clean with a dry, lint-free tissue or, for more thorough cleaning, use a lint-free tissue moistened with either a mild solution of washing-up liquid or isopropyl alcohol. Do not put the cooler or CPU under running water. Note that both the base of the heatsink and the CPU should be dry, free from residues of thermal compound and free from grease before re-applying thermal paste and re-installing the cooler. Many mainboards do not go below 40%, 50% or even 60% PWM duty cycle on case fan headers. Please refer to your mainboard manual to verify whether the fan header actually goes down to 20% duty cycle. If that's not the case, in some cases you can use the fan speed control software supplied with your mainboard to overcome these limitations and reduce the fan speed even further. However, 3rd party tools like SpeedFan offer greater flexibility and better options to work around the limitations imposed by the mainboard vendors. Note that mainboard manufacturers use different terms to indicate that Pin 4 is not being used for PWM control (e.g. “+5V”, “VCC” or “NC”), but if one of these terms is used, you can be sure that the fan header does not support PWM. 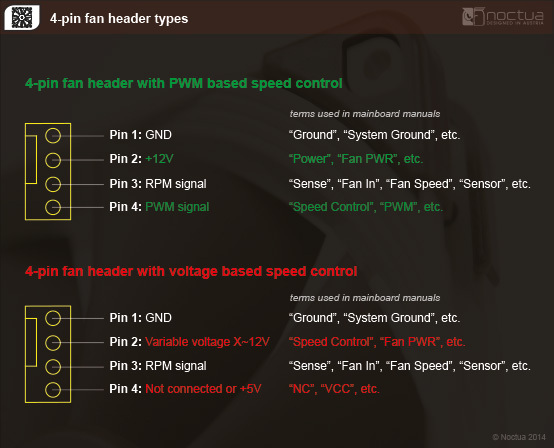 If Pin 4 is described as “Speed Control” or “PWM” or the like, you can be sure that the fan header supports PWM. Unfortunately, the description of Pin 2 is not always a clear indication as some manufacturers use terms such as “Fan PWR” or “Power” for both types of fan headers. However, if Pin 2 is described as “Speed Control”, you can also be sure that the fan header does not support PWM based speed control. If Pin 2 is described as “+12V”, this is a clear indication that the fan header supports PWM. Please also note that in some cases, the descriptions of the pin layouts in the mainboard manuals may not be correct and some models actually allow you to switch the fan headers from voltage control mode to PWM control mode in the BIOS even though the pin descriptions do not indicate PWM support. We thus recommend to look for these options in the BIOS before taking other measures. In case of doubt, please contact your mainboard manufacturer. If your mainboard features other 4-pin fan headers that use PWM for speed control, you can run multiple fans from these headers using Y-split cables. Make sure not to exceed the specified maximum power draw of the fan headers (usually 10-12W) though. Choose a higher fan speed profile in the BIOS (e.g. „normal“ instead of „silent“, etc.) or deactivate automatic fan speed control and use a Low-Noise Adaptor instead. Use the mainboard‘s fan speed control software or 3rd party tools like Speedfan to regulate the fan speed. Unlike BIOS based fan speed control, the supplied software usually checks whether the fan has stopped and increases voltage accordingly or at least offer more options to set up the fan properly. Noctua PWM fans feature a minimum speed of 300rpm to allow for ultra quiet operation when your CPU is at idle state and doesn’t require higher cooling performance. Some mainboards display error messages such as “CPU fan error” during the booting process when the fan speed is below a certain level. If you get such error messages using your Noctua PWM fan and if such options are available in your BIOS, please either adjust the minimum fan speed monitoring limit to 200rpm or increase the minimum PWM duty cycle. If your BIOS doesn’t offer these options, please disable CPU fan errors. For detailed information on BIOS fan settings, please consult your mainoard’s manual or contact your mainboard manufacturer. Some mainboards display a CPU fan error when the fan speed falls below a certain threshold, e.g. 900rpm. If you want to run the fan below this speed (e.g. using the supplied U.L.N.A. ), please adjust the threshold in the BIOS or disable CPU fan error warning. Depending on the chassis, card and motherboard being used, installing PCIe cards in a vertical position using riser cards may cause compatibility issues with CPU coolers. Whether there will be a problem or not depends on the exact position of the card (which is determined by the PC case and/or optional vertical GPU holder bracket), the width of the card as well as the position of the CPU socket on the motherboard. In order to verify that there is sufficient space for the cooler, please measure the distance between the centre of the CPU socket and the top of the PCI card in order to make sure that the cooler fits. We create and update our compatibility lists with the utmost care. Unfortunately, mainboard manufacturers tend to change certain components and heatsinks without pointing it out by using corresponding revision names. If you run into problems while installing our coolers on one of the mainboards listed as being compatible, please don't hesitate to contact our support team at support@noctua.at. Please also keep in mind that other components such as narrow or small cases as well as memory modules with special (higher) heat-spreaders can cause compatibility-issues. For use in systems from Dell, HP or Lenovo, please note this FAQ. Our case compatibility list helps you to quickly identify which PC cases offer sufficient clearance for which Noctua CPU coolers. The compatibility indication is based on the height of the coolers (including fans) as well as the maximum CPU cooler height specification given by the chassis manufacturer. Caution: Please note that the fans of some tower coolers (especially larger models with 140mm fans, e.g. NH-D15 or NH-U14S TR4-SP3) may overhang the RAM slots and that this can cause compatibility issues if RAM modules taller than 32mm are used. While the fans can be moved upwards to increase RAM clearance, this will increase the total height of the cooler and thus requires additional clearance inside the chassis. As a rule of thumb, if the fan overhangs the RAM, the maximum CPU cooler height specification of the case must be at least the size of the fan plus the height of the RAM minus 7mm (accounting for the height of the socket and CPU). For example, if a cooler uses a 140mm fan that overhangs the RAM and 46mm tall RAM modules are used, the max. CPU cooler height specification should be at least 179mm (140+46-7=179). For further information and instructions on how to move up the fan for each cooler model, please click the height specification link. Disclaimer: We create and update our compatibility lists with utmost care. However, case manufacturers sometimes change parts or details of their products without prior notice or explicitly indicating a revision. Therefore, Noctua cannot accept any liability, nor in any other way be held responsible, for the following compatibility information. For further information on CPUs exceeding their TDP ratings and how to configure the UEFI BIOS in order to avoid excessively high temperatures, please see this FAQ. Please also see our general buying guide, motherboard compatibility list and FAQs for further help on how to select the best cooler for your configuration.